1. In small saucepot, prepare quinoa blend as label directs with 1 teaspoon olive oil; stir in almonds, if desired. 3.Heat remaining 2 teaspoons oil in large skillet over medium-high heat. Add salmon, skin side up; cook 5 to 6 minutes or until golden brown on bottom. Turn salmon and cook 4 to 5 minutes or until internal temperature reaches 145°F; spread some horseradish-mustard sauce over salmon pieces during last 3 minutes of cooking. A 3-ounce serving of salmon is not only loaded with 19g of protein, but also is low in sodium and an excellent source of omega-3s. These omega-3s are healthy fats that are beneficial for our bodies in more ways than one. They can help reduce high triglyceride levels in the blood, which can lower your risk for heart disease. Also, omega-3s can help with inflammation in those with arthritis to reduce stiffness and joint pain. 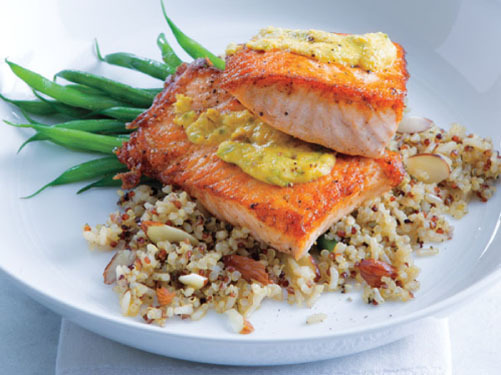 Serve salmon alongside steamed fresh green beans tossed with a little butter, lemon juice, salt and pepper.